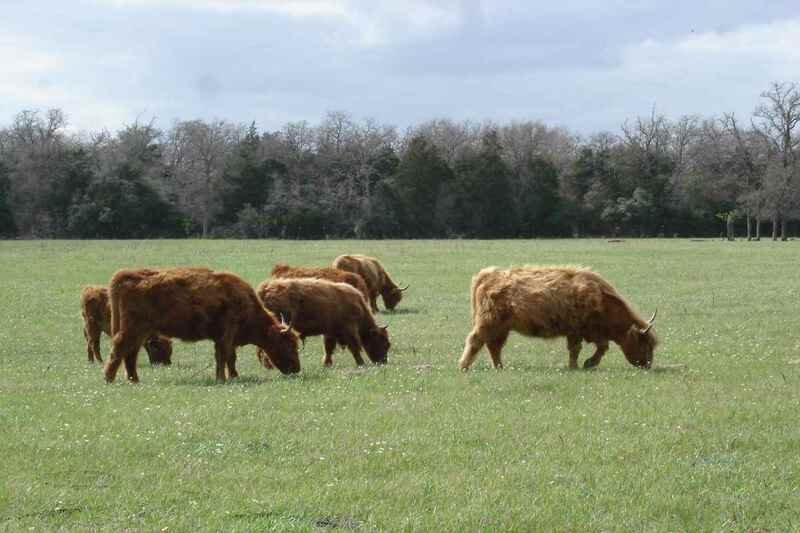 At Peach Creek Farm we raise Berkshire hogs and Scottish Highland cattle. Our hogs are free range. We use no artificial restraints or industrial type enclosures. The facilities include an open barn that allows the pigs to stay out of the harsh weather during the winter and out of the sun during the Texas summer. We have a farrowing houses separated from the general herd area so that the pregnant and nursing sows are not bothered by nosy pig neighbors. The hogs have access to a tank so that during the summer they can wallow and stay cool. This is an important facility since a hog may overheat during our hot weather. 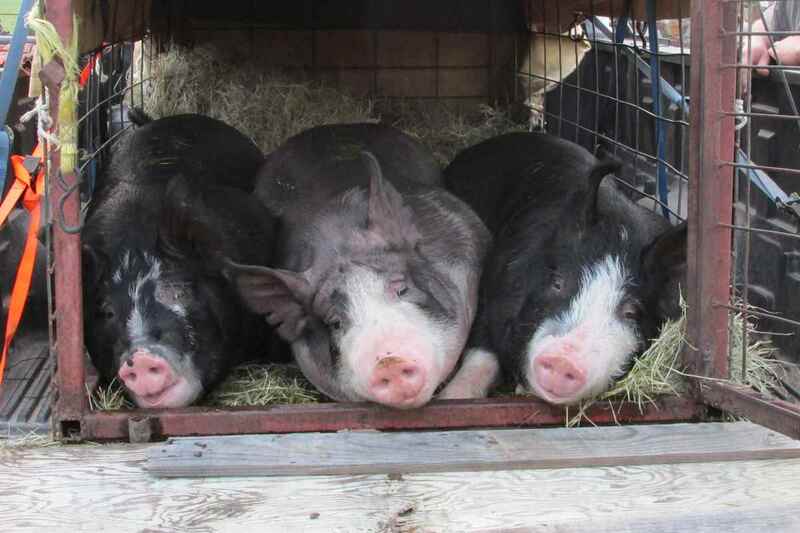 The breeding stock at Peach Creek Farm are all registered Berkshire hogs. This breed has a long history and the meat from Berkshires is sought after for its high quality and exceptional taste. We sell pork at local farmers markets and from the farm. Our cattle are grass fed - pasture raised and pasture finished. We use no medication other than required to keep a healthy herd. Our breeding stock is primarily Scottish Highland cattle, and a very special polled Hereford cow. Highlands are an easy going breed requiring little special care. They survive both in the harsh, cold climate of the Scottish Highland and the Hebrides islands, as well as the heat of a Texas summer. The beef from pasture raised cattle is healthier than feed-lot and grain fed beef. Pasture raised beef is higher in Omega-3 fatty acids and Conjugated Linoleic Acids (CLA) than grain fed beef. These fats are linked to reduced risk of cardio-vascular disease and cancer. Because we pasture raise our cattle and never feed animal protein, there is no risk of them contracting bovine spongiform encephilitis (BSE - mad cow disease). We add no hormones or steroids to the anything consumed by our cattle, so these cannot be passed along to humans in the beef products. For more information about the health benefits of grass-fed beef click here. For more information about the of cooking grass-fed beef click here. 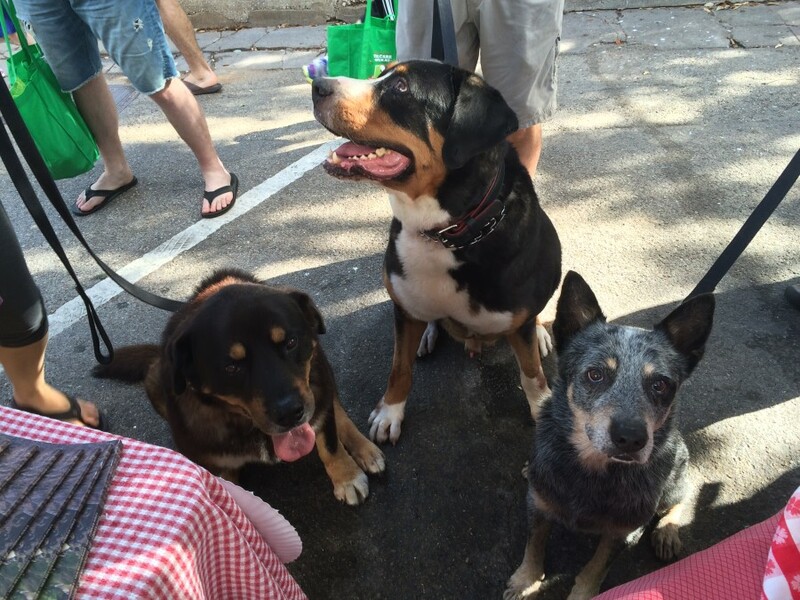 For your four-legged friends we carry dog bones and our very own "Puppy Pâté". The bones are hard and will not splinter. We do not recommend cooked bones for dogs as cooking makes the bones brittle and have a tendency to splinter. The Puppy Pâté is a cooked meat product that your dog will love. Bring your dog to the market for a free sample. But be warned — your dog may not forgive you if you do not get some every week!